Deputy Chief Mark Chatterbok was hired by the Saskatoon Police Service as a Special Constable in the Detention Unit on December 1, 1981. Two years later, he was hired as a regular Constable and attended the Saskatchewan Police College graduating with the highest average grade in his class. Deputy Chief Chatterbok worked in Patrol and at the Service Centre for eight years. He moved into the Traffic Unit for two years followed by five more years in Patrol. He then worked for four years in the Morality Unit and Serious Crime Unit. He was promoted to Sergeant in November of ’02 and was assigned to the Vice Unit and two years later was transferred to the Training Unit in the Human Resources Division. During this time, Deputy Chief Chatterbok held Acting Inspector positions in Records Management and Human Resources as well. He was promoted to Inspector in January of 2005 and became the Executive Officer to the Chief of Police/Public Affairs Inspector for one year. Deputy Chief Chatterbok then moved to Records Management until he was promoted to Superintendent in 2007. He was assigned to the Criminal Investigations Division before taking over Patrol. In January of 2012, Deputy Chief Chatterbok was promoted to Deputy Chief of Police in charge of Administration. He now has the Operations portfolio, overseeing Criminal Investigations, Patrol and Public Affairs. Deputy Chief Chatterbok was born and raised in Saskatoon, Saskatchewan. His post-secondary education includes receiving a Bachelor of Commerce and a Master of Business Administration from the University of Saskatchewan. He graduated from the Senior Management in Policing (sponsored by the Police Executive Research Forum in the United States), and graduated the FBI National Academy in Virginia, U.SA. In 2004, Deputy Chief Chatterbok initiated the formation of a Recruiting Issues Committee to review and develop consistency in the recruiting selection process. He participated in a committee to set provincial standards and identify issues to be addressed by the Saskatchewan Police Commission. He initiated the development of the Introduction to Investigative File Management Course at the Saskatchewan Police College and an annual in-service training course for Junior Constables. During his time as Superintendent in charge of Criminal Investigations, Deputy Chief Chatterbok spearheaded an initiative to form an Integrated Child Exploitation Unit in Saskatchewan; a shared unit between the Regina Police Service, Prince Albert Police Service, the RCMP and the Saskatoon Police Service. During his career, Deputy Chief Chatterbok has been an active member of provincial, national and international associations. 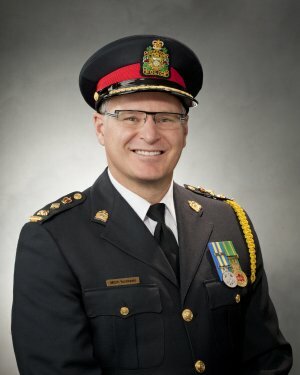 He is a member of the International Association of Chiefs of Police (IACP), the Canadian Association of Chiefs of Police (CACP), and the Saskatchewan Association of Chiefs of Police (SACP), and has sat on several local and provincial committees. He is the co-chair of the CACP Human Resources and Learning Committee, and a member of the CACP Organized Crime Committee. Deputy Chief Chatterbok is a CACP representative on the Public Safety Steering Committee for the Canadian Institute for Public Safety Research and Treatment. He is the past chair of the Prairie Region National Justice Committee of Senior Justice Officials and is currently the chair for the Saskatoon division. Deputy Chief Chatterbok was an Honourary Aide-de-Campe for the Lieutenant Governor of Saskatchewan from 2006 to 2018. He is a long-time board member with the Saskatoon Crisis Intervention Service and also sits on the Board of Governors for the Corp. of Commissionaires North Saskatchewan. In recognition of Deputy Chief Chatterbok’s contributions to policing, he was awarded the Member of the Order of Merit of the Police Forces by the Governor General of Canada. He is also the recipient of the Queen’s Diamond Jubilee Medal, Police Exemplary Service Medal and Bar, the Saskatchewan Protective Services Medal and the Saskatchewan Centennial Medal. Deputy Chief Mitch Yuzdepski was hired by the Saskatoon Police Service as a Special Constable in the Detention Unit on May 4, 1987 after having spent the previous year as a Special Constable with the Kindersley RCMP. He was hired as a regular Constable a few months later and attended the Saskatchewan Police College. In 1994, Deputy Chief Yuzdepski moved to the Canine Unit for eight years. He returned to Patrol for three years and was promoted to the rank of Sergeant in 2005, where he became the Administrative Sergeant. In 2007, he moved to the Major Crime Section working in Violent Crime and then Homicide. On April 1, 2010, he was promoted to the rank of Staff Sergeant and assigned to Patrol in Central Division. A year later, Deputy Chief Yuzdepski moved on to the Forensic Identification Unit. In 2012, he was promoted to Inspector and assigned to Central Division - Patrol. During his two years in this role, he helped develop the Community Support Officer program and HUB. In 2014, he transferred to Specialized Uniform Operations where he facilitated the implementation of Combined Traffic Services of Saskatchewan, the Automated Speed Enforcement camera program, the Police Cadet program and the Police and Crisis Team (PACT). In 2016, Deputy Chief Yuzdepski was promoted to Superintendent in charge of Patrol. In October of 2018, he was promoted to Deputy Chief of Police in charge of Support Services (Headquarters, Specialized Uniform Operations, Central Records and Asset Management, Finance, Technological Services and Human Resources). Deputy Chief Yuzdepski was born in Cudworth, Saskatchewan and raised in Saskatoon. He has been active in the community by coaching soccer for a number of years and has played key roles in various national sporting events hosted in Saskatoon. He currently sits on the Grants Committee for the Saskatoon Community Foundation. Deputy Chief Yuzdepski’s post-secondary education includes a Bachelor of Arts in Sociology and a certificate in Business Administration from the University of Saskatchewan. He is a graduate of the Senior Management Institute for Police at Boston University and has completed the Senior Police Administration course at the Canadian Police College. 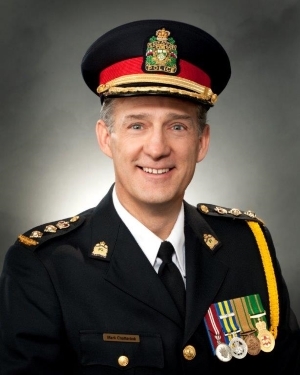 Deputy Chief Yuzdepski took part in the Canadian Association of Chiefs of Police Global Studies Program – “Improving Outcomes; Police & Mental Health.” He is a leader in advocating for mental health, especially among officers. He developed the Mental Health Strategy for the Saskatoon Police Service, including supporting the Mental Health First Aid training for members. Deputy Chief Yuzdepski is a past president of the Saskatoon Police Executive Officers Association. He’s a member of the Saskatchewan Association of Chiefs of Police, the Canadian Association of Chiefs of Police, the International Association of Chiefs of Police, the Canadian Society for Evidence Based Policing and the Association of Canadian Critical Incident Commanders. In recognition of Deputy Chief Yuzdepski’s contributions to policing, he was awarded the Government of Canada Police Exemplary Service Medal and Bar and the Saskatchewan Protective Services Medal.